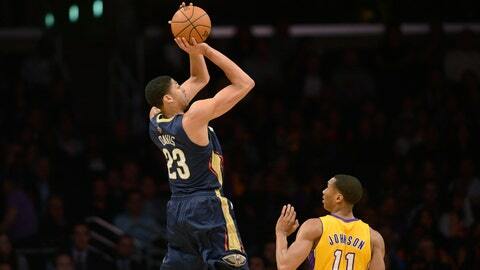 LOS ANGELES (AP) – Anthony Davis had 28 points and 15 rebounds, Eric Gordon also scored 28 and the New Orleans Pelicans beat the Los Angeles Lakers 132-125 Tuesday night to snap an eight-game losing streak. Brian Roberts scored 10 of his 19 points for New Orleans during a 1-minute span in the fourth quarter. Tyreke Evans had 24 points and 11 assists, helping the Pelicans salvage the finale of a five-game road trip that included a 32-point loss to the Clippers on Saturday night at Staples Center. The win ended a string of nine straight road losses to the Lakers and was only the third for New Orleans in the last 18 meetings overall — including a 96-85 victory Nov. 8 in which Davis had a career-high 32 points.